Coloring lace, ribbon, flowers with Copics. You can use Colorless blender solution or 91-95% Isopropyl rubbing alcohol, which is a LOT cheaper. Pour some alcohol into its lid, or very small container. Lay down the copic color you want onto an acrylic block. You do this by pressing the tip of the pen onto the block with gentle pressure. Take a regular small paintbrush and dip it into the alcohol...the more alcohol on the brush the lighter the color. If you want a vibrant color, wipe the brush once onto a paper towel. 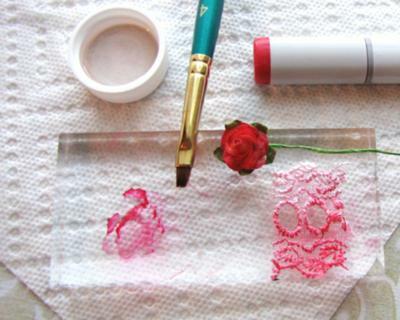 Next, take the brush and mix it with your color on the acrylic block and brush onto flower, lace etc. You will see that you use very tiny bit of marker. You can make it as dark or as light as you want by how much alcohol solution you have on the brush. Here is a white rose and white lace I did with R29 in a super hurry. Thanks for sharing this tip with us. It's always nice to match ribbons lace or flowers to the colour scheme for your card and this is a super easy way to achieve that look.